Home / Trading / Trading Advice / Should You Get into the Sizzling McDonald’s Stock? Should You Get into the Sizzling McDonald’s Stock? McDonald’s (NYSE:MCD) stock has seen higher prices since a dip in mid-September. Following an analyst upgrade yesterday on Oct.10, MCD stock initially opened up 2%, but ended the day down amidst the global stock market sell-off. Despite the current volatility, I expect the positive momentum in McDonald’s to continue well into the earnings report later in the month. Specifically, there are three bullish plays in MCD stock that I want to share with you, as each play could lead to impressive profits. Despite the fierce competition in the (IEO) segment, McDonald’s — globally recognized as the Golden Arches — remains one of the most popular brands in the world. Although its menu exhibits some local and cultural differences, McDonald’s still serves a substantially uniform menu. As one of the largest fast food chains around the globe, over 90% of McDonald’s restaurants are currently franchised. On Sept. 21, MCD declared a quarterly common stock dividend of $1.16 per share, payable on Dec. 17 to shareholders of record on Dec. 3. This pushes the dividend yield over 2.5%. As part of its efforts to increase shareholder value, McDonald’s has been increasing dividends almost every year for more than four decades. Many analysts and investors regard MCD stock as a value proposition based both on its dividend yield and the strength of the balance sheet. McDonald’s latest earnings results on July 26 came in better than expected. Management gave an upbeat outlook on long-term profitability and credited the Velocity Growth Plan launched in 2017 as well as the Tax Cuts and Jobs Act of 2017 with the strength of the numbers. Despite the slowing of U.S. sales, McDonald’s stock has benefited from international growth. 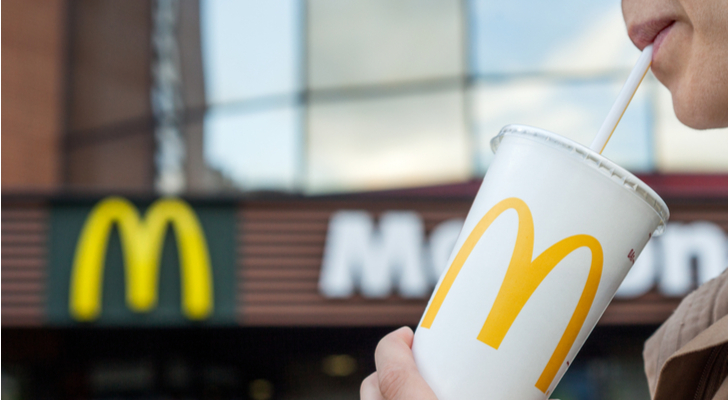 Management believes that the value deals to be implemented in the McDonald’s menu globally, but especially in the U.S., will help increase sales numbers. Year-to-date (YTD), MCD shares are down 2.2%. However, I believe the current positive momentum in the stock will continue in the weeks to come, especially around the earnings report of Oct. 23. MCD stock’s 52-week price range has been $146.84 (Mar. 2, 2018)-$ 178.70 (Jan.29, 2018). Within the next six months, I expect MCD stock to trade between $170 and $180. Those investors who pay attention to moving averages should note that the technical message has improved to a “buy,” while oscillators are giving a wider range of “neutral-to-buy” readings. Short-term support for MCD is ﬁrst at $165.50 and then at $163; meanwhile, short-term resistance in BG stock is ﬁrst at $169.90 and then at $172.50. If you are also of the opinion that the executive management is going to improve its balance sheet further and that McDonald’s stock is ready for a new leg up on both technical and fundamental grounds, you may want to add MCD to your portfolio this October. 1. Buy 100 shares of McDonald’s stock at a limit price of $168.37. You should expect to hold this long stock position for up to one to six months for an approximate 6%-8% gain. You may consider placing a stop loss at about 3% below your entry point. 2. Use an in-the-money covered call covered call, whereby you would buy 100 shares of McDonald’s stock at a limit price of $168.37 and, at the same time, sell a MCD 21 Dec $165 call option, which currently trades at $6.55. The $165 option is slightly ITM, offering more downside protection in case of increased volatility in MCD stock, especially this week and around the earnings call. This call option would stop trading on Dec. 21 and expire on Dec 22. Assuming you entered this covered call trade at the closing prices on Wednesday, at expiry, the maximum return would be $5.18 (i.e., ($8.55- ($168.37-$165))*100), excluding trading commissions and costs. An ITM covered call’s maximum profit is equal to the extrinsic value of the short call option. The trader realizes this gain as long as the price of MCD stock at expiry remains above the strike price of the call option (i.e., $165). 3. Sell a 21 Dec $165 put option with a limit price of $3.55 — its closing price on Oct. 10. Assuming you would enter this put selling strategy at the closing prices on Wednesday, the upside is that you keep the premium as long as McDonald’s stock closes above $165 when Dec. 21 options expire (excluding trading commissions and costs). The downside is that if MCD stock trades below $165 ahead of expiration, you could be assigned 100 shares for each sold put at the cost of $165 per share. I believe a new leg up in the MCD stock price is coming. However, as prudent investors, it is always crucial to maintain a clear risk/return profile. Thus, if the rebound does not happen, a test of the previous lows and toward the high $150’s level could be the next leg down. Article printed from InvestorPlace Media, https://investorplace.com/2018/10/should-you-get-into-the-sizzling-mcdonalds-mcd-stock/.